hangforum.com - The Archive • Web community for Hang players and friends of the PANArt Hang • View topic - What separates a Hang from a Halo or Bell? What separates a Hang from a Halo or Bell? Post subject: What separates a Hang from a Halo or Bell? I thought it might be useful to start another topic regarding this subject, since it is a little different than "what is a handpan". If you moderators think that this is unnecessary, please feel free to delete the category and we can continue in the other thread. What separates a Hang from a Halo or Bell? If we are trying to create a name for this new instrument genre (or genres), then I think we need to discuss what properties of the Hang justify it to be in a separate category of its own. 1. Is the Hang in the same category as the Halo or Bell? (Obviously, the title of this thread). 2. Does a 1st Gen Hang need to be classified in the same category as the Halo or Bell? If so, why? If not, why? 3. Is the Hang considered a compilation of its evolution (1st gen up until IH)?? Or is it now that the Hang is only the IH, and that is what we are classifying. 4. Specifically, what characteristics of the Hang set it apart from the Halo or Bell? I am sure there are more questions that are relevant to this topic that will add color to this discussion. Please feel free to ask them if you have them, and maybe we can get to the bottom of this and determine if there is indeed a need for a different subcategory. Post subject: Re: What separates a Hang from a Halo or Bell? this is another question as my question in the "what is a handpan" thread. I just wrote a comment and answer on your question in the other thread. I think we have a few overlapping in this and the "Handpan thread", but if you want a discussion of this question it is maybe better to make another topic. The bigger problem is, that I dont had the chance to play on this instruments. I played a lot of Hanghang and can say a lot of the quality of Hang, but I cant form an complete opinion about Halo and Bell before I play the instrument in real. What I see on the videos and read in the first comments from players and also on the Halo website is, that the Halo has a different sound as the Hang. This is one of the differences. But your question was "what seperates Hang from Halo and Bell". Before I understand your question wrong because of my limited english, I have to ask me what you mean with "seperates". You open a new topic and so you have another question as the "category" question in the other topic? I think these questions are better as a separate thread, even if it is related to the other (long) "What is a handpan?" thread. With time, I think we will hear from more people who have direct experiences with both a hang and halo, and look forward to hearing what they have to say. I have also seen the comments that the halo is not a hang, or that it is "different." I know it is difficult to describe sounds with words, but I look forward to more specifics about what people mean by these comments. Om, I think your question #3 is worth keeping in mind in this discussion, since there have been roughly 6,000 hangs produced until now, and we should remember the differences within the category of what we refer to as a "hang." To answer your question, my concept of hang is all of them, though there are times when it is useful to be more specific and speak of a certain type (1st Gen, Udu hang, 2nd Gen, and IH), of a certain scale or note combination (with 1st Gen or 2nd Gen, respectively), or even a single specific instrument, since each one is unique and has its own particular characteristics. I'm holding a "10 foot pole" and it may not be long enough! here you can hear, what one of the points is what make a halo "different". I dont say "seperate", because I dont know what you mean. The Halo sound is for me very! different from the Hang sound. But I am a little bit confused. Is this a final version or the next prototype as a youtube member post in the comments? I thought Kyle only sell instruments where he is 100% confident with. So, it must be a final version, or not? Frank, what is the difference that you hear? It isn't exactly like a hang, but it's hard to tell from a video, and this player seems to be rather new to it (from his comments). I don't think it's a prototype--it's a distribution model. But the highest note in the circle is higher than Kyle had originally planned. BTW, I worry about the title: "Shane's first Halo Drum video (the american hang)" Drum and hang both--yikes! do you realy read my posting? I wrote i dont! say: "seperate". I only say you can hear what is "different". I dont say, that this different sound seperate the instrument in different categories. And I hear a different sound. Or not? A similar percussive playing style on an early 1st generation Hang. Listen to what could be described as "shape" of the sound. The dynamic progress of each sound that is excited. i think it is an unfair comparison because the hang video is produced with professional audio and video equipment. i think any comparison is unfair unless made by the same player with the same equipment in the same place. The tuning itself should have absolutely NO bearing whatsoever on whether or not they are in the same category. do you agree, that the quality of the sound from a Hang make the biggest part, why people are so facinated? If anybody copy the shape and dont care about the sound (only a hypothetical question. I speak not actually about a special instrument) , is this an instrument in the same category as the Hang only because a similar shape ? Maybe it is?! There are a lot of realy bad guitars in the world. The Hang is on a very high level in sound quality. It is in my eyes a piece of art. If it is not an artist work, so it must be easy to copy it. I remember, that I only ask hypothetical questions! Stand this pictures in the same category? Yes, both are pictures. If you speak with an child, this is likely the answer. If you speak with an art connoisseur he will tell you likely that this pictures are not standing in the same category. 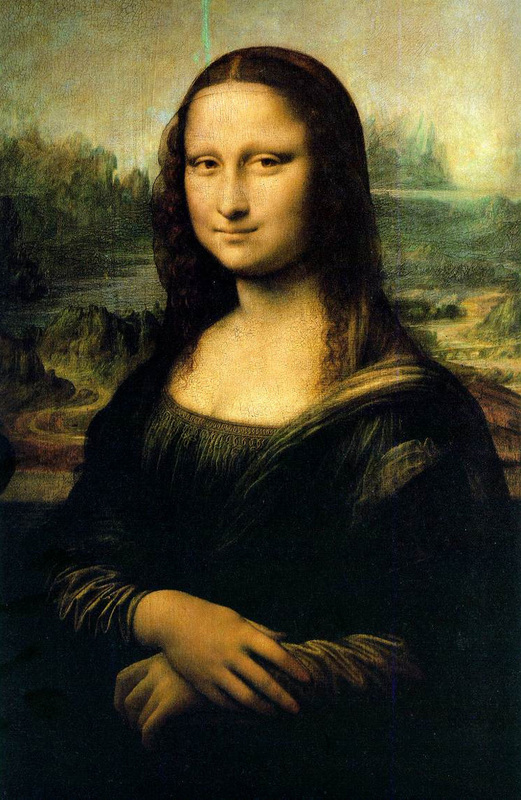 What is with a copy of the Mona Lisa? Same category? What has made the Hang to an instrument and sound sculpture in this quality? Why so much people want a Hang, that it is a good idea to make copys and have a good business? So, if in the future a factory take the shape and make thousands of similar looking instruments every week. Same category? Another point of view to think about. What make a Hang a Hang? Any comparison is inperfect. But even with that inperfect comparison you can detect some characteristics. My offer stands: If Kyle send me a Halo for a few weeks I will make a comparison including sound examples taken with the same equipment and the same player. If Kyle send me a Halo for a few weeks I will make a comparison including sound examples taken with the same equipment and the same player. The Halo is not a PANArt Hang. Spectral analysis isn't what I would do. The aim of a comparison is not to show that there are differences but to demonstrate the characters or qualities of the differences. My offer was a reaction to michael colley's plea that the comparison of the videos was unfair because of different players and recording situations. I don't think that the two videos are comparable. In Shane's Halo video he is using multiple striking surfaces (many finger pads) and leaving his hand in contact with the Halo. The other vid is professionally recorded and he is primarily using one finger pad per note and quickly removing his hand. For a better comparison, Cheap did us a favor by recording and playing both Halo and IH in the same manner. Thanks for that! The main sound difference that I hear between the Hang and Halo is with the ding and flat area around the ding (Is there a name for that part?). The ding doesn't seem to have the pop that I hear in Hang and Bell videos, and the flat part sounds more tinny/ metalic sound to me. It appears that the flat part is bigger on the Halo. there are a few comments, that this is another prototype. Can anybody confirm that this is a final Halo? If not, I wonder about the comments Kyle made in the foretime not to send Halos to players if he is not 100 % confident. That realy confuse me. Look Funky, I'm in a grumpy mood, so I'll just spit it out and be done with it. You can choose to be as confused as you like, but stop being a jerk. You can find something crappy about anything you choose to. this comment I dont understand. I ask a question, because I dont know if I have to think about the sound from this video as a final Halo, or as a "prototype". I realy dont know if this is the ready Halo, because of the comments on the video. I dont choose to be confused, I am confused. Why? Because of the statements from Kyle, that he dont sell "prototypes" in the foretime. I understand, that he give you a prototype. But I only want to know if the comments on the video are true or not. You know a little bit german language. My translator say me, that "Jerk" is realy on the border to an personally affront. But maybe I understand again something wrong. So, it is ok. Hang, Halo, Bell.......all the same family instruments with her caracters and sound. only the feeling of the player with his instrument is important....nothing else. After the Hang ( just because it was the first in this musical instruments family and open a new door of sound !! )....all same instruments sell on the market is just business. The spirit of the making and the selling of this instruments are different. Personnaly, i'm not sensible of the sound of the Halo and i like more the Bell. I have the great pleasure in my life to play my music and my fellings on a IH....Thanks to Sabina and Felix to create this instrument. For the rest.....i repeat....the ONLY important things is what you feel when you plys on this kind of instrument the rest is boring. PS: sorry to are a little bit rude but now, it's was more than a month to just see on the forum topics after topics of boring discussions about "what is better of the Hang", "The Halo is more that of that", "The sound of the IH is more deep", etc etc etc.....i think the forum is more dedicated to discuss about many others things of that. Sorry for my poor english but i hope you understand the "spirit" of my sentences. For all of you....leave in peace and in music with all kind of instruments. after one night sleeping I complete my posting above. I speak with a lot of persons in the last time. The most agree, that it was a big mistake from Kyle to make a initial video while he know that this instrument has a problem and!!! start to collect money only because he beliefed that he can fix the problem. If you read his update about that, he speak about this problem he find after gluing the two halfes together. So a lot of people paid money and now it seems, that Kyle give Prototype instruments to a few people. I know that other are waiting and they have numbers on the list where they normally must have the Halo before this new Pygmy prototype was sold. For me it is not a bagatelle to collect money before I know that I have a working product. Kyle stated with big words: "No Halo leave the workshop, before it is 100% for him." So, is he happy with the Halo and the problem he has? Or what are the new standarts from him? For me it seems, that he made a big mistake. He start to work under the pressure of the market and made promises. It seems at the moment he cant make so much Halos in a good quality as he thought. This is ok and understandable. Normally a good time to say: "Hey , I find out a few problems. I go in my workshop and at the time i have this Halo i promised I come back and sell this. But prototypes? He cant do this easy, because he collected money. Pressure of the market, a bad situation for instruments like that. Sorry, if this sound a little bit rude. But I can do this. I am a Jerk.